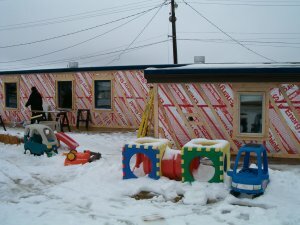 The Jubilee Fund provided support to the Downs Children Centre daycare in 2008! The Downs Children Centre (DCC), a not-for-profit registered charity, who provide daycare services on a part-time and full-time basis for 50 children, operating from 5:30 AM to midnight. DCC needed important facility upgrades and renovations to their building and the Jubilee Fund was excited to support them in their efforts! The Centre offers a 1,200 square foot facility with over 1,200 square feet of yard space and play area for the children that is fully fenced in. It is also the only day care in the west end of Winnipeg that has a specialized ability to teach American Sign Language. The business employs 16 full time and one part time employees, as well as two senior management positions. DCC caters to the west end of Winnipeg, as well as to staff at the Assiniboia Downs. The Centre prepares lunches at a cost of $1 per child and prepares dinners for the children as well.